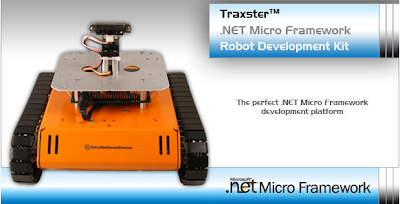 Wirte your own progrmms for Traxster robot using .NET Micro Framework Robotic Kit.
. Now you can learn the .Net Micro Framework, and use it develop cool autonomous applications using the Traxster Robot! This is the coolest .NET Micro Framework development kit available! The Traxster MF Robot Kit uses one of our Serializer Robot Controllers for the low level sensory and motor control, and features the SJJMicro EDKPlus development kit that serves as the .NET MF brains. The EDKPlus kit is based on the 200 Mhz iPac-9302 ARM9 processor, which is where the Tiny CLR runs. Developing managed C# applications for the Traxster MF is extremely easy, and deployment is a snap. Managed applications deployed to the EDKPlus board are non-volatile. Thus, the application starts right up once power is applied. This kit comes packed with hardware and user documentation, including a Visual Studio 2005 Solution containing the source code for the SerializerLibMF library and useful examples. Want to learn the .NET Micro Framework, and have tons of fun doing it? The Traxster MF Kit is your development solution! Cool where can i get the cost on it.